ABOUT four years ago, at the suggestion of a mutual friend, Ronald C. Wornick paid a call on Malcolm A. Rogers, the director of the Museum of Fine Arts, Boston, looking for a home for the contemporary decorative art that he and his wife, Anita, collect. "I had a long list of questions, and I had a list of other museums we were considering," Mr. Wornick said. "At the end of meeting, I threw out the list of museums and practically jumped into his lap. He said all of the things I wanted to hear in the most earnest way." Since then, the Wornicks, who live in San Francisco, have promised to give the museum about $5 million worth of art and have donated more than $2.5 million in cash to endow a curatorial position. Mr. Rogers and the museum have charmed a lot of people like the Wornicks lately. In a seven-year campaign that ended in 2008 — for a new wing, the endowment and operating expenses — the museum pulled in $504 million plus $165 million worth of art. After one slow year, it followed that with donations of $57 million, including art, in the year to June 30, and another $40 million, all told, since July 1. Nearly a third of the donors are new to the museum, and many live outside Boston and New England. 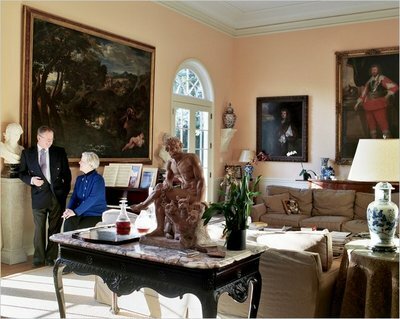 They include New Yorkers like Leonard A. Lauder, chairman emeritus of Estee Lauder; Leslie J. Garfield, the real estate broker; Arnold Scaasi, the fashion designer; and Simone and Alan Hartman, the art dealers. In addition, there are Carol and Terry D. Wall, founder of a medical equipment company in New Jersey; Candace and Michael Humphrey, an investor in San Antonio; the Sumitomo Foundation, of Japan; and the Art Mentor Foundation Lucerne, of Switzerland. Those numbers, and names, are extraordinary for Boston, where giving levels rarely approach those of New York, and the museum does not even have an annual benefit (its last was in 1997). By comparison, the Los Angeles County Museum of Art began a $450 million campaign in 2004 and has raised $324 million, drawing from a hometown population six times that of Boston. In Chicago, more than four times Boston's size, the Art Institute took eight years to raise $412 million to build its new wing. "A number of people have come up to me and said, 'We never thought you'd do it,' " said Mr. Rogers. Even some trustees had doubts. But on Saturday night, to celebrate the opening of the new Art of the Americas wing, 1,500 donors from near and far will be eating Nantucket bay scallops in black truffle vinaigrette, followed by cognac-and-clove cotton candy, and dancing to a 16-piece orchestra, at $1,000 each. They will be dazzled by a "guest as artist" wall exhibit that projects rotating, 18 feet by 24 feet images of those brave enough to step up to a camera. The Brazilian Girls will perform. It is all being orchestrated by Bryan Rafanelli, the events planner who oversaw Chelsea Clinton's wedding last summer. Just how the museum managed this feat provides a tough lesson for these difficult times, when giving is sluggish. The pitch, Mr. Rogers says, was never need. It was vision. "It's how do you transform into a vision the needs of an institution and make it one that people want to invest in. It's important to think of donors as investors who'll think that you'll use their donations efficiently." That is why, in the years before the campaign, Mr. Rogers worked hard to turn around the museum, which was bleeding red ink when he arrived in 1994. He made cuts, reorganized the staff and mounted an ambitious exhibition program, ending each year since 1996 with a surplus. He extended hours, reopened the museum's historic grand entrances and organized exhibitions of objects like guitars and cars that had popular appeal. "My vision is to open the museum to as many people as possible, to give to as many opportunities for close encounters with art to as many people as possible," he said. Only then did the museum begin soliciting in earnest. "I always say," Mr. Rogers explained, "don't go to people and say, 'We really need your money because we have a leaky roof.' Go and say, 'We want the very best roof in America because this is a very great institution.' "
The economic timing was good when, in July 2001, the museum began the "quiet phase" of its campaign, seeking major gifts from trustees, patrons and new donors, mostly from Boston and New England. Among them: Penny and Jeffrey N. Vinik, a onetime manager of Fidelity Investments' Magellan Fund. In 2000, Ms. Vinik was invited to be an M.F.A. overseer, an advisory post below trustee. As she grew more involved, Mr. Vinik decided to surprise her with a birthday gift — a multimillion-dollar donation that will put their names on a gallery in the new wing. Ms. Vinik is now a trustee and heads the museum's Fashion Council, a new group focused on adding 20th- and 21st-century fashion to the M.F.A. 's trove of historic costumes — and, eventually, to emulate the Metropolitan Museum's Costume Institute gala, which raised $9 million last spring. But the museum always knew it had to go beyond its environs, and Mr. Rogers said he looked to Boston's status as a college town. "We began to think, does the M.F.A. have alumni? No, but it does have people who went to college here and first learned about art at the M.F.A." Or people who grew up in Boston but later left, like the Wornicks. Using traditional tactics, like introductions from trustees, the museum cultivated donors like Ms. Wall, who graduated from Tufts University nearby. Ms. Jacoby figures that Mr. Rogers has entertained about 400 people a year for the museum for the last seven years, giving about 10 dinner parties and three cocktail events a year. And his involvement went deeper than playing host. He helped determine when people should be invited to his home, who else should be there and the seating arrangements. "Some people you invite to say thank you, and others to bring nearer, and always to meet people," he said. His efforts have not always gone smoothly. The museum has given exhibitions of collections owned by many potential donors: English silver owned by the Hartmans; decorative arts from the Wornicks; paintings, sculpture, even boating trophies and a yacht from William I. Koch, the billionaire investor, among them. Some museum experts frown on the practice — unless the collection has been promised to the museum — on the theory that an exhibition adds value to it. And when the Hartmans auctioned off a collection of Chinese jades about two years after an M.F.A. exhibition, raising millions, controversy flared. But Mr. Rogers said most American museums mount collector shows. He branded as "nonsense" the idea that an exhibition adds to a collection's value in any category except contemporary art. "We do not do vanity exhibitions here," he said, "but we bring art held in private collections into public view." In any case, the idea of quid pro quo deals between donors and the museum falters with two examples: a display of contemporary works owned by Eli and Edythe Broad, who live in Los Angeles, yielded no donation. Nor did an exhibition of vintage cars owned by the New Yorker Ralph Lauren. Were they asked? "What do you think?" Mr. Rogers replied. The museum's reputation for openness was critical to Mr. Lauder, a major arts patron in New York with no ties to Boston. In 2002, seeking a museum for a collection of 20,000 postcards made by early 20th-century Japanese artists, he called the Freer and Sackler Galleries in Washington, the Metropolitan Museum and the M.F.A. The Freer said, "We'll get back to you," he said, and the Met took a long time to find someone to respond, but "the M.F.A. was down with a couple of curators within minutes." Since then, he has promised to donate another 100,000 postcards, along with monetary support to catalog, digitize, publish and exhibit the postcards, and he endowed the Leonard A. Lauder curator of visual culture position — a total exceeding seven figures. "It was love at first sight for the whole thing," said Mr. Lauder, who declined to comment on future gifts. "Anything is possible," he said. "Malcolm is irresistible as a fund-raiser."